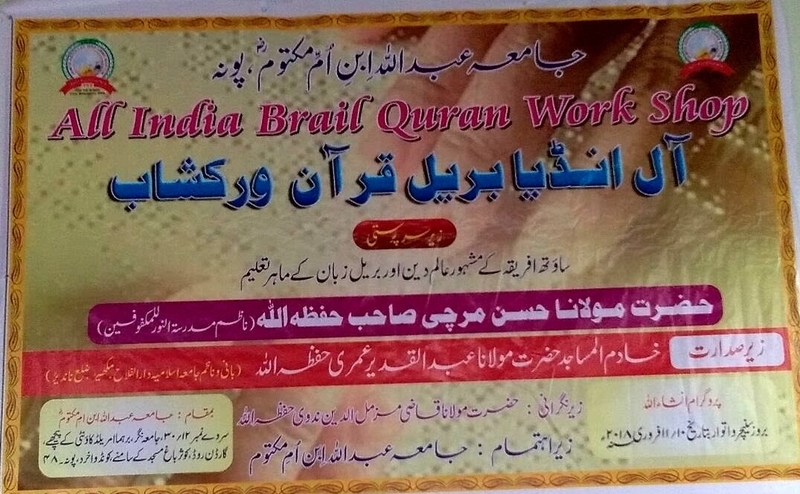 An All India Braille Quran Workshop took place on the 10 and 11th February 2018 at Jamia Abdullah ibn Umme Maktoom(RA) Emereld Country, KausarGardenPuneMaharashtra India. Our Principal Moulana Hassan AK Murchie was invited to attend this workshop. The convenor was Moulana Qazi Muzammiluddin Nadwi and the chief guest was Moulana Abdul Qadeer Omari Sahib. Alhamdulillah, this workshop was very successful wherein many developments that were previously not possible were achieved at this meeting. For the first time , an All India Braille Qurán Foundation was established. We commend the principal Mufti Raees Sahib for the excellent accommodation and meals provided for the delegates. Also attending this workshop were Madrassa An Noor for the Blind'sgraduates Moulana MuhammadIslah Busakorn and Moulana Hassan Tonsen from Thailand. The melodiousTajweed recitation of the Holy Quránin Qir'aat Sabah inspired the student and teachers listening. Muchemphasiswas given to work hard in mastering correct recitation of the Holy Quran. May Almighty Allah Ta'aalagrant us all his help and may He accept all our feeble efforts. Aameen.